The long slanting light and the wild beauty of the heath and hedgerows at this time of year always yields a fruitful inspiration for my work. 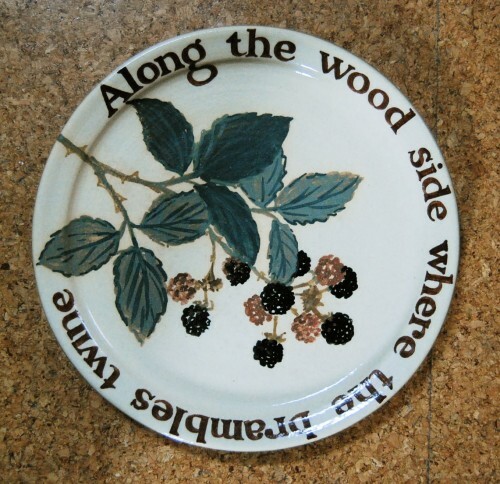 This blackberry bowl has a characteristically visionary inscription by Walt Whitman (from Leaves of Grass), celebrating the extraordinary beauty and significance of the common natural things that surround us, a view he shares with so many of my favourite writers, including John Clare, Vita Sackville West, Virginia Woolf, Kathleen Raine, and so on. 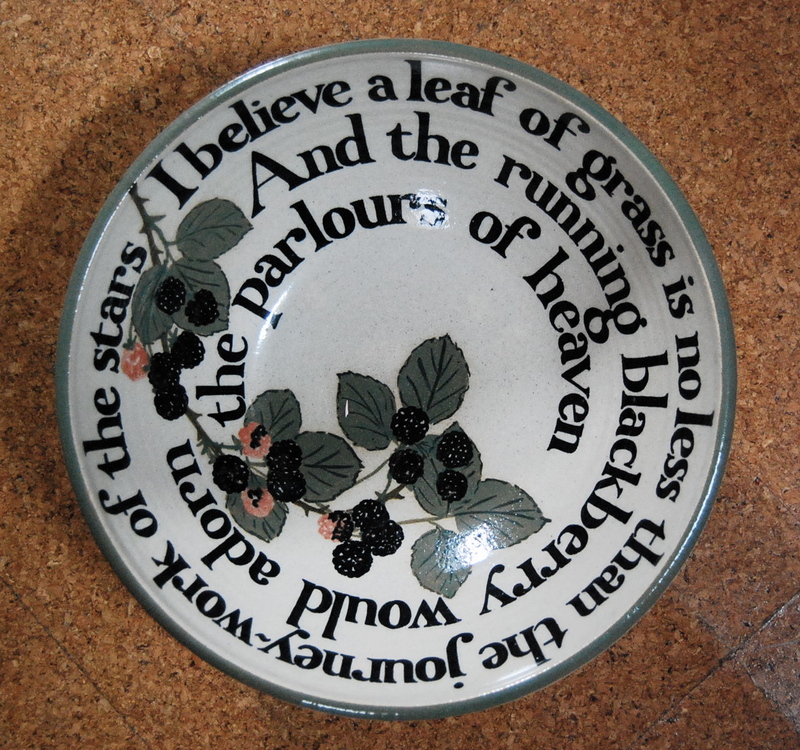 This small plate (8″ across) is the October plate in my 12 piece dinner service from John Clare’s Shepherd’s Calendar, which has a plate or bowl for each month of the year with inscriptions from each month’s poem. (I’ll be showing this large group of pots in my first post of the year next year, January 2011.) I particularly like painting blackberries; the shining ripe fruits, the prickly twigs and the light through the leaves. The text here is painted freehand with a brush in a rich dark brown mix of underglaze oxides, fired with a clear glaze. 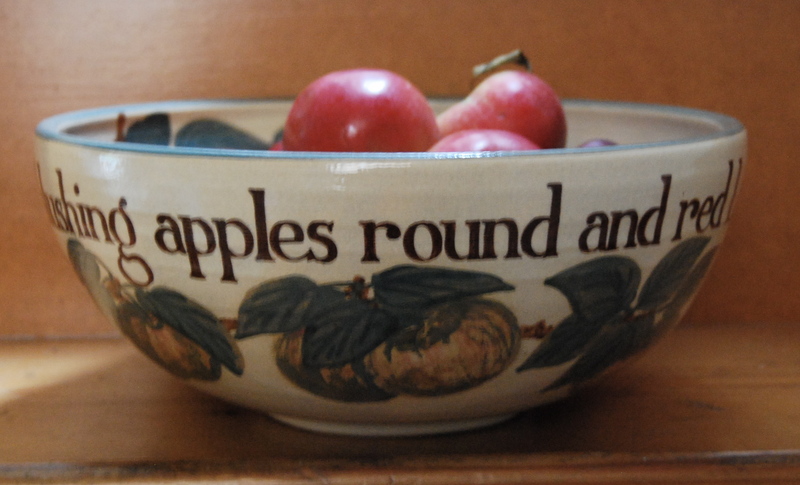 For more information about fruit bowls, Autumn pots or any of my work, please leave me a note in the comments box below, or click on contact details for other ways to get in touch. This entry was posted on	October 8, 2010 at 12:22 pm	and is filed under Work in focus.